Dr. Jeannine Herron did not set out to be a software developer. However, it became clear as she and her colleagues investigated the uses of technology in education, that existing software did not fulfill the company’s vision of how computers could help children learn to read and write. Writing is probably the most difficult task elementary students face. 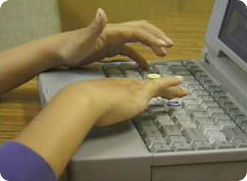 But Talking Fingers believes that computers are tools that can make both reading and writing easier. Dr. Jeannine Herron and her team became intrigued by the notion that if children could learn to keyboard and use a word-processor in first grade, they could use the computer as a tool for writing all the way through their elementary years and beyond. All children have to do is learn a finger stroke for every speech sound. Since there was no software available that would teach typing-by-sound in this fashion, the plan to develop Read, Write & Type was born. An important guiding principal was to integrate phonics, encoding, decoding, word-processing and keyboarding into one program–learning to read and write. Another guiding principal was to make the program engaging and fun for children. A third was to integrate phonics and keyboarding with whole language activities. Drawing on the experience of 20 years of neuropsychology research, RWT was built on a solid base of information about how the young brain learns. Safety nets were built in for those children who have difficulty with language tasks or who are learning English as a second language. In RWT, children practice phonics continuously, as they type meaningful words, phrases, sentences and stories within an overall story context. Every time they sound out a word, they associate each sound with a finger, press the key, see the letter appear, and hear the computer say the sound. They make those associations thousands of times as they progress through the adventure. They will hear, say, see, and type hundreds of words. This unique approach — using a particular finger or fingers to make the letter(s) for a particular speech sound — is what makes RWT so powerful. Children use their eyes, ears, mouths, and fingers simultaneously. This multi-sensory approach engages motor memory as well, and greatly strengthens learning. The unique premise of our software is that spelling out words develops fluent phonics skills and is a powerful route to reading. Using the keyboard makes spelling out words and writing much easier for young children, since most first-graders find keyboarding easier than using a pencil. Read, Write & Type and Wordy Qwerty create a natural “IN/OUT” feedback loop, which is the most effective type of learning for a youngster’s developing brain. Children listen to spoken words or sentences (IN), then sound-out and spell them (OUT). As they spell out the words, they read (IN) and get visual and auditory feedback from the computer (IN) to correct their own errors (OUT). Because they are highly motivated to complete the stories, children enjoy this continuous practice, which develops an easy fluency with the phonics code. RWT and Wordy Qwerty help children build vocabulary skills and learn grammar, punctuation, spelling and keyboarding in an integrated fashion, while holding their interest and enthusiasm by means of rich graphics, fast response time, life-like animations, lip-synched speech, and original dialogue and music. Talking Fingers, Inc., was originally a subsidiary of California Neuropsychology Services (CNS), a non-profit organization for research and education. Founded in 1982 by neuropsychologist Dr. Jeannine Herron, CNS provided more than 50 conferences in neuropsychology in major cities across the U.S. and conducted numerous research projects in schools throughout California, funded by organizations such as the W.S. Johnson Foundation, the Hearst Foundation, and the John S. and James L. Knight Foundation. Talking Fingers, Inc. was established by the same team in 1994, with the express purpose of developing quality educational materials. Since that time, the company has been awarded four Small Business Innovative Research grants from the National Institute of Child Health and Human Development (NICHD) to develop and do research with educational products. Talking Fingers has based its software development on many years of research on how the young brain learns, and the software has been field-tested extensively in California schools. Our goal is to empower generations of children with excellent writing, reading, and thinking skills that they can use to enrich their personal lives, earn a livelihood, and contribute toward a more literate and thoughtful society. The Talking Fingers approach is unique and is based on a simple idea: text is speech made visible! We use our mouths to talk, to make the sounds of words. We use our fingers (with a pencil or keyboard) to represent those sounds on paper. When children learn to link speech sounds with letters, they can use the alphabet code to write any word they can say. Their fingers are “talking”. This approach is aimed at maximizing the activation of the left side of the brain where skilled reading and writing are processed. Dr. Jeannine Herron and her staff continue to develop new versions of their software for children at home and in school. In January 2009, they released an Online Edition of Read, Write & Type and in 2010 released an online edition of Wordy Qwerty. 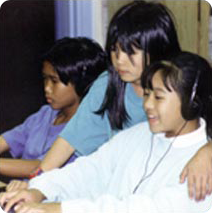 Read, Write & Type also includes help for children learning English as a Second Language (ESL). Extensive audio help is provided in Spanish, Arabic, Malay, Mandarin, Japanese, Farsi, Tagalog, Korean and Portuguese. In the early years, CNS designed and produced over 50 conferences in major U.S. cities on topics such as learning disabilities, brain organization, and intervention strategies for brain injury. Concurrently, Dr. Jeannine Herron and her staff began researching the effective use of computers as tools for learning. In 1991, CNS established the Media Learning Center at Dominican College in San Rafael in 1991. Each year, Technology in Education courses required for the California teaching credential, have been offered in collaboration with the college’s Academy for Professional Development. CNS also developed a series of summer workshops, demonstrating their vision for incorporating computers and technology into the classroom curriculum. CNS programs have been supported by generous funding from the Walter S. Johnson, William Randolph Hearst, Joseph Drown, Valley, and John S. and James L. Knight Foundations. The CNS computer lab was established with the generous donation of 20 Macintosh computers from Apple Computer. In 1994, CNS set up a for-profit subsidiary, Talking Fingers, Inc., and other educational materials for teaching phonics, writing, keyboarding and word processing to young children. The company’s name is taken from the Apple IIe software first developed by Dr. Jeannine Herron, that was the foundation of Read, Write & Type. In 1992, Leslie Grimm, creator of the best-selling Reader Rabbit software programs, joined the CNS/Talking Fingers team as designer and producer. Over the next 5 years, Talking Fingers (CNS) tested the first version of its Read, Write & Type software program with children in numerous California schools and incorporated its findings into the final version of the product. That version was released for both Macintosh and Windows platforms in 1994, under a publishing and distribution arrangement with The Learning Company, a major publisher of educational software for the home and school markets. More recently, research with at-risk first graders was carried out by Dr. Joseph Torgesen, and the program was upgraded for online play. 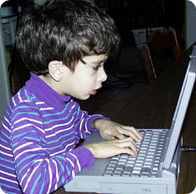 Our Wordy Qwerty spelling software was developed with another grant from NICHD in 2005. In 2012, a NICHD grant enabled Talking Fingers, Inc. to develop a series of mobile tablet applications for pre-k and kindergarten literacy called Talking Shapes. Our goal is to empower generations of children with excellent writing, reading, and thinking skills that they can use to enrich their personal lives, earn a livelihood, and contribute toward a more literate and thoughtful society.